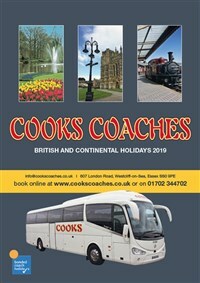 Cooks Coaches began trading in Southend-on-Sea in 1908. 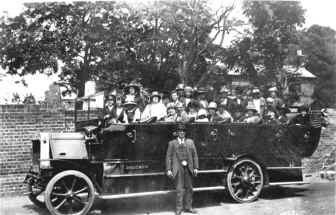 The business was founded by William Cook who had previously been running buses in Gravesend, Kent since the 1890's. Today the business is still in the family and run by his grandson - also William Cook. The first coaches were horse-drawn, but unfortunately we do not have any photos of them. After that came the char-a-bancs and outings were very popular. This picture was taken around 1917. 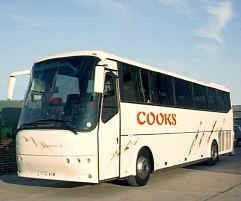 Cooks now run a modern fleet of coaches which are regularly maintained on our own premises. Facilities on each coach vary, but all are fitted with seat belts and air conditioning. You will generally find reclining seats, toilet, and tea/coffee machines and some coaches have a fridge. All are driven by experienced, friendly drivers who are delighted to welcome you aboard.